This is my first newsletter since becoming president of the AMA at the end of September. I have, though, been following what you have been doing in the community over the last year and I am looking forward to being part of your conversations going forward. "Conversation" is an important word in health care, as this month's special survey clearly shows. 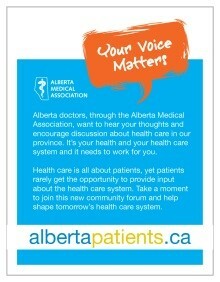 In this issue you will find the very interesting results of what albertapatients members told us about the experience of being a patient in Alberta's emergency departments. There is much that is working but also many things we can improve. Communication will be key to making some of those improvements. As usual, we have provided you with some significant highlights below as well as the complete survey report with all the details. What stood out for me were the results showing that people do not feel they are getting the information they need to understand what happens in the emergency department. Almost half were mistaken about the basic rule governing who is seen first and on what basis. There is also a real desire to be updated and informed while waiting as to how long the remaining wait is likely to be and what is going on. We will be sharing this information with Alberta Health Services, Alberta Health, the Health Quality Council of Alberta and the AMA's Section of Emergency Medicine, among others. I hope that the information you have provided can be applied to make some improvements in the future. Certainly it will increase understanding of the patient perspective as everyone works together to meet the needs of Albertans. 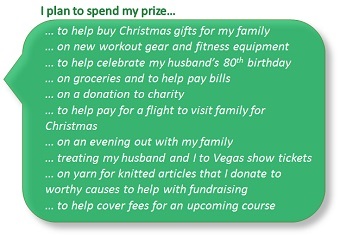 Thank you for your time and contributions to albertapatients so far. I am looking forward to what we will learn -- and communicate about -- in the year ahead. We recently asked albertapatients members about their perceptions of and experiences with seeking emergency care in Alberta. Please read on to the Did You Know section (below) for highlights from that research and a link to the full report. Emergency Departments: Patient Experiences and Perceptions. Did you know? Most patients wait 1-3 hours to see a doctor in an emergency department. When asked about their last emergency department visit, 72% of patients we spoke with reported that they saw a doctor within three hours, with the 'typical' wait falling between 1 and 3 hours. That said, the perception of long wait times at Alberta emergency rooms is pervasive. Views are likely based both on bad experiences at some point in the past as well as not enough information about emergency departments and processes being made available to patients. 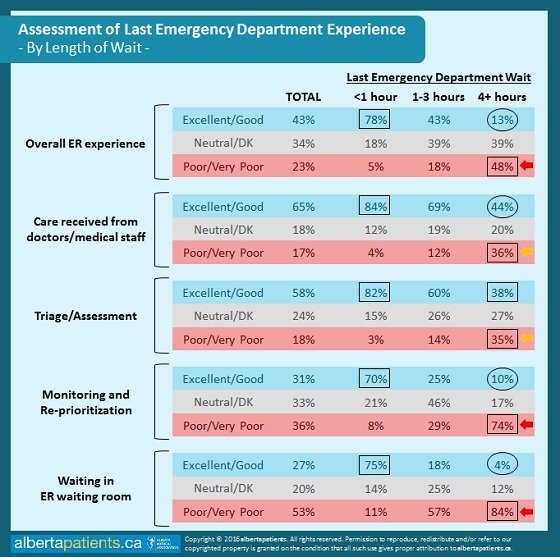 Alberta patients generally understand the processes of the ER, but lack enough information about how patients are prioritized and seen – which impacts their expectations and experiences. 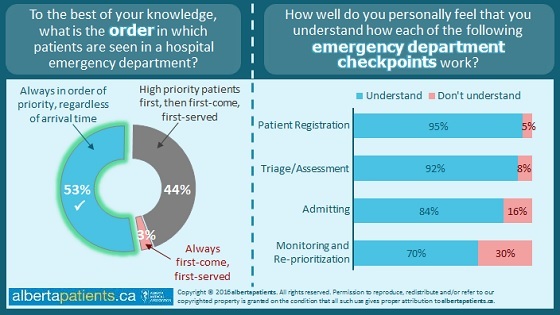 Although nearly all Alberta patients understand that high priority patients are seen first in a hospital emergency department, just over half (53%) correctly identified that patients are always seen in order of priority - regardless of arrival time. The remainder selected a prioritization process that involves at least some aspect of first-come, first-served, suggesting a need for increased clarity around and visibility into how emergency departments triage and monitor/re-prioritize patients. Wait times have a direct impact on ALL aspects of the ER experience in terms of rated performance – the longer the wait, the less satisfaction. When asked to rate their last experience in an emergency department waiting room overall, 43% said they had a positive experience, 33% felt neutral, and 23% said their experience was either poor or very poor. However, patient assessments of overall experience (and particularly key aspects such as care received, patient monitoring and being in the waiting room) diverged after factoring in the amount of time waited during the last emergency department visit, particularly among those who waited 4+ hours to see a doctor.